So, when everyone is trying to create and push content in the market, how will you make sure your content reaches your audiences effectively? How will you give your content that little extra push to get it to stand out from the rest? The answer is simple! You’ll need to effectively distribute, share and promote your content through owned, earned & paid media. Owned Media – These are the content channels that you own. It could be anything that you’ve created and you control, right from your website to your company blog and your social media pages. Earned Media – This is the media that you’ve earned such as the press and users sharing your content or discussing about you. It essentially means the content that’s been voluntarily given to you by others. Paid Media – These are the third party channel that you pay to leverage. It could be anything including advertising on third-party sites to sponsored content on social media channels. Most marketers and business leverage these channels to promote and push content in the ever-so-competitive market. Sadly, a fair share of marketers and businesses either shy away from using paid media channels or ignore them completely. If used cleverly, paid media channels can boost your content distribution efforts. Unless you have been living in the caves, we’re sure you understand the ever-increasing significance of content for businesses looking to garner mileage in the fiercely competitive market. Now, content reigns supreme in any digital marketing strategy. The ever-growing popularity of social media and Google’s newest policies where it rewards good content and punishes bad practices have it all the important for businesses to invest in creating and promoting high-quality and useful content. But the content overload on the Internet has desensitized users towards brand content. Resultantly, even the most amazing content pieces fails to grab eyeballs. This is where Paid Content Distribution provides you an optimal solution. Remember, as things are evolving, our distribution strategy and understanding methods should too. With Facebook and Twitter increasing focus on monetization, there’s a massive opportunity for marketers looking to grab more and more eyeballs for their content. Add to this the growing audiences available through content discovery platforms such as Outbrain and you’ll have the perfect recipe for successful content distribution. The big question then is: How do you leverage this in the most effective way possible? Roll-up your sleeves and brace yourselves for we’ve put together a two-part guide on Content Distribution quick win strategies to help get your content the attention it deserves. So, without further ado, let’s take the plunge and check out these simple, effective and powerful quick wins to include in your content distribution strategy this 2016. 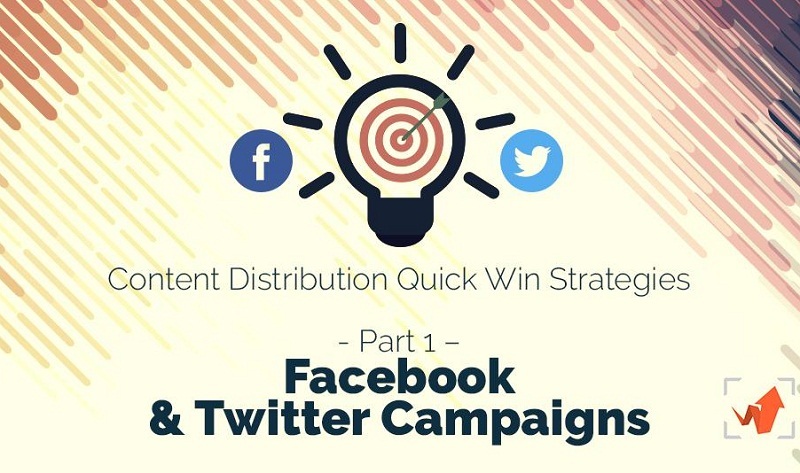 So, without further ado, let’s take the plunge and check out how you successfully include Facebook’s ‘Boost a Post’ feature and Twitter Ad campaigns in your content distribution strategy this 2016 and get your content the attention it deserves. Remember, millions of content pieces are created and published on the web every second. This means just producing and publishing fresh and unique content isn’t enough to get noticed. This is where social, and particularly, Facebook, comes to your rescue. With over 1.591 billion monthly active users, Facebook remains one of the largest social media platforms globally. It even drives a quarter of all web traffic. Quite naturally, it ranks as one of the top points of content consumption on the web. According to a report by Shareaholic, Facebook’s referral traffic is three times higher than all other social networks combined. This makes it an inevitable marketing channel you can’t afford to ignore. But reports in the online media reveal that the organic reach on Facebook is dead. Nora Flint reveals that Facebook generated revenue of 10.9 billion dollars from advertisements in 2014. It is predicted that this revenue will increase to 17.2 billion dollars in 2016. That is more than 150% of earnings in 2014. This revelation begets the big question – How will you get your content in front of more eyes on Facebook when its organic reach has died? Facebook Boost a Post is your answer! With a careful preplanning and a little budget, you can boost your content and find and engage more and more audiences on Facebook. Here’s everything that you need to know to get started smoothly. Boosting posts on Facebook is a powerful and cost-effective way to get more visibility and exposure to your content. IT makes it easy for you to reach out to new audiences and grab more and more eyeballs for your content. It isn’t a rocket science and all you need to do is to follow the simple steps mentioned below to boost your posts on Facebook. Boosting a Post - To boost your post, simply go to the post you’re looking to promote, this can either or a new post or even an existing post, and click Boost Post in the lower right corner of your post. Once you click on Boost Post, you’ll get the option to select your target audience and your budget. Objective – Before moving on to the next step, take a second and carefully determine your objectives for boosting Facebook post. Decide whether you’re looking to increase fan engagement with your content or are looking to traffic back to your site. Engagement – You may choose to boost a Facebook post to get more and more people interact with your Facebook page. Better engagement can have a great impact on the overall reach of your content. Traffic - Driving traffic to your website could be another major objective of boosting a Facebook post. This can help you engage buyers and prospects with your business. Now that you’ve determined your objective and boosted your post, it’s time to start working on getting it in front of your target audience. Targeting - There are two different ways to target your content. You may select “People who like your page and their friends” or “People you choose through targeting.” If you select the latter, you'll be able to specify who you want to show your boosted post to on the basis of their geographic location, age group, gender and interests. Nora Flint suggests in a blog to understand your audience for it may help you reduce the overall budget of your content promotion. So, before you go ahead boosting a post at Facebook, do well to determine what type of content your users respond to most in your updates. Budget – Selecting a budget when boosting your Facebook posts is easy and convenient. All you need to do is to decide how much money you want to put behind your content. Your content’s daily reach is determined by the budget you’ll choose. Remember, the better your budget, the more eyeballs you get for your content. Measure – Just like setting up the campaign, picking up your target audience and selecting your budget, it is easy to measure your boosted post’s performance. Analyze your post’s performance against your objectives to determine whether or not this campaign contributed to your overall success. Organic Reach: The number of people who saw your post in their News Feed, or on your Page's Timeline. Paid Reach: The number of people who saw your post through an ad. Click on See Results at the bottom of your boosted post to see the demographics of the people who saw your boosted posts and the actions they took as a result. You may also check the results by going to your Ads Manager or Page Insights. Here are some best practices, plus and infographic to help guide you as you build your Facebook Boost Post campaigns. To boost content with highest ROI value. Choose content that promotes your products or services and spreads awareness about your brand. All boosted posts are approved by Facebook before they appear before users. So always play by the Ad Guidelines stipulated by Facebook. To optimize images appropriately. Ensure that the images are 1200px by 1200px and videos are video 16:9. Only 20% of an image can include text in the boosted posts. So, ensure to follow the 20% text rule when boosting posts on Facebook. Twitter boasts of 320 million monthly active users. And if you’re a content marketer and are looking for more eyeballs on your content, Twitter could be your go-to channel. Using Twitter Ads is an easy way to get your content in front of larger audiences. And you don’t necessarily have to spend a fortune on it, either -- Twitter ads can be effective even on a relatively small budget. Visitors from Twitter tend to be highly engaged, and are very likely to share your content further, creating an organic boost on top of your social distribution. But you can do a lot more than simply drive referral traffic using Twitter advertising — each type of Twitter campaign is great for something different. No wonder, 88% marketers use Twitter for content distribution. Here’s what you need to know to get started with Twitter ads. Twitter Ad Campaigns – Business leader, Hammad Akbar reveals in a blog that Twitter Ad campaigns are instrumental in powering marketing strategies. Twitter provides multiple campaign options to promote your content. All sponsored tweets say “Promoted by The Brand’s Name”. It’s recommendable to use few tweets for each campaign. This allows you to engage a wider audience. Engagement Tweets – One of the most used Twitter campaigns, Engagement Tweets campaign is the campaign where you’d put money to promote regular-looking tweets. You can compose a new tweet on the campaign page or select an already published tweet. It’s the easiest Twitter campaign to put together. Conversion Campaign – This Twitter campaign includes an image, a headline, a URL, and a call-to-action in order to guider readers to click on the link. You’ll need to create a Website Card. This campaign can help you promote your content amongst users who aren’t necessarily your Twitter followers. Then, you’ll need to attach the Website Card to your tweet, and add a short description of the content that you plan to promote. To track conversions, set up a website tag. Go to Tools > Conversion Tracking > Create new website tag, and set up proper code. Lead Campaign – Just like This conversion campaign, this campaign too includes image, headline, URL, and call-to-action. But in this campaign, instead of a website card, you’ll need to add Lead Generation Card. Targeting - Twitter campaigns allow you to target Keywords, Interests and followers, Television, and Tailored audiences. For tailored audience, you may upload a list of e-mail subscribers other than your Twitter followers. You may also choose target specific devices or platforms. Budget – Setting up your campaign budget is easy on Twitter. There are three main components of campaign budget - daily minimum budget; bid range per engagement; and total spend for that campaign. Twitter allows you to adjust your budget and bid while your campaign is running. Measure – Campaigns dashboard allows you to track and monitor the performance while your campaign is running. You can view your campaign stats based on a certain range of dates, platforms, locations, and demographics. Simply combine this information with Twitter Analytics results to see how your sponsored tweets are performing. Here are some best practices to help guide you as you build your Twitter Ads campaigns. Ensure 4-6 relevant Tweets running at all times. Add at least 1 new Tweet every 5-7 days. It will keep your campaign fresh. Segment your campaign as much as possible - even if the usernames are related to the same interest or category, create multiple campaigns to include different groupings of user accounts. Enter words or phrases that you think your desired audience would Tweet, rather than topical search keywords. Aim to include 50-100 keywords (including variations) per campaign. Use no more than 2 interest categories and no more than 10 subcategories per campaign. It takes an awful lot: a lot of efforts, a lot of time and a lot of patience to create a compelling, engaging and useful content, but if no one is reading it, consider it non-existent. There’s no point investing so much of time, effort, and resources into producing high-quality, engaging and interesting content if readers don’t knows it’s there. Remember, successful content marketing isn’t just about producing torrents of fresh, creative content pieces each day’. But it is about what happens after you finally hit the “publish” button. Every marketer has certain content goals that they aim to realize through successful content, be it boosting brand awareness, capturing more leads, or attracting more sales. But in order to realize these goals, your content needs to reach your target audience effectively. You can do this easily and efficiently with these content distribution strategies. We’re sure these 2 quick win strategies discussed in the part of the Content Distribution Quick Wins Series will save you time and amplify your reach by automatically distributing your content to readers who are ready and willing to consume interesting and engaging content. Stay tuned for part two of the series where we’ll discuss how you can leverage LinkedIn Direct Sponsored Content, Outbrain Content Discovery, and StumbleUpon Paid Discovery to make your audiences much more receptive and engaged with your brand. This is a guest contribution from Mike Dane of Truconversion.com.